Welcome! Today is 22.04.2019. The local German time is 22:37:56. 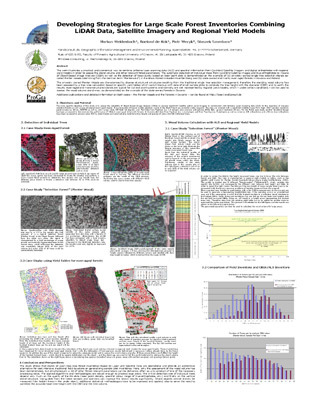 SilviLaser Flash-Poster: "Developing Strategies for Large Scale Forest Inventories Combining LiDAR Data, Satellite Imagery and Regional Yield Models". Poster presented on the SilviLaser 2008 Conference in Edinburgh. Click here to download and open the the 1 MB big poster in a new window (download may take a few seconds). Please note: when you click the right mouse button over the new window, the Flash navigation menu will open and you can use it to zoom ("zoom" or "vergrößern") and move the poster ("forward" or "vorwärts").